Content matters, and it really mattered here. 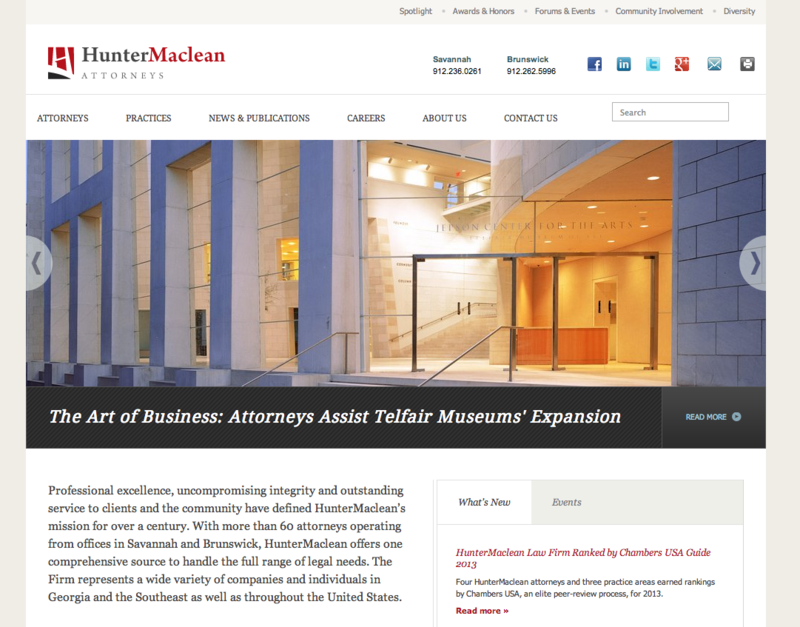 Our work for HunterMaclean, a large law firm headquartered in Savannah, has recently been recognized with a Silver Addy, a Communicator Award AND it was a Webby Honoree too. Needless to say, we’re thrilled. It’s really gratifying, not the statue part (although no-one around here is going to knock shiny), but the part where the work is recognized for achieving what we set out to do for our client – take a complicated message with a large number of moving parts and deliver it in a clear, user-friendly format. We began the process with HunterMaclean in 2011 when they chose to work with us to refresh their brand and re-imagine their online presence. We got down to the basics with them in order to really understand the story they needed to tell, and then focused on delivering that message as clearly and engagingly as possible. Usability from the client’s perspective was the bottom line. The website, which launched in Spring last year, speaks both to the diverse experience of the firm’s attorneys and their clients’ successes while also highlighting their long history of community involvement. This site is deep. Content matters, and it really mattered here. There is a tremendous amount of valuable and relevant information to be shared with clients, and it is constantly being updated. We needed to develop a way to access existing and updated information and present it in a way that made sense to visitors to the site. The attorney bios were the most complex component of the build, and are dynamically generated using a significant amount of content parsed from various sections of the site. Additionally, there is a high-level of site-wide interlinked content highlighting the accomplishments of the firm and its attorneys. As always, thanks for working with us, this is one we’re really proud of. Even though we love ALL our children JUST the same.